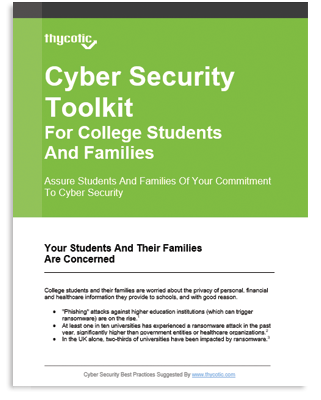 The Cyber Security Toolkit for College Students and Families is an essential guide to help higher ed institutions communicate cyber best practices throughout their school community. Filled with ready-made, easily digested and sharable resources, the Toolkit helps schools provide students and families with tools and skills to improve their own cyber behaviors. Schools can customize the Toolkit to reflect the details of their own practices and expectations for responsible cyber behavior. When schools publish and share the Toolkit they reinforce their commitment to cyber security and proactively address concerns prospective and enrolled students and families have about privacy and security of their personal information.